What’s harder, finding the perfect horse or the perfect livery yard? For both, there are definitely lots of options, but you can be limited by factors such as price and location. Let’s say the hunt for that perfect horse or pony of a lifetime is over, you’ve found the one! Next on the list is where will home be for your new four-legged friend? Do you need livery/boarding or are you lucky enough to accommodate them at home? If livery/boarding is required, what kind will you go for? DIY livery/ Partial boarding – normally you’re just supplied with the stable and hay but everything else is up to you, it’s worth noting that not all livery yards offer this. When learning to ride, most start at a riding school having lessons. If a rider wants to continue the experience of riding but on a horse of their own, many riding schools can accommodate their new horse. I’ve found this to be a great benefit to both horse and rider. For the rider it gives them confidence as they are familiar with the riding school and area. And for the horse, they can continue having regular lessons to improve their relationship with their fairly novice rider in a safe environment. I did this myself for a few years and it was ideal when I was starting out. This also could be an option if you enjoy riding but haven’t always got the time. Often a riding school are happy to take on safe horses to use in the riding school. Their owners can then enjoy them when they have the time. It’s also a great way to socialize with other equestrians due to the groups that are normally in a lesson – what’s better than riding with friends? You’re not obligated to stay there forever. You can and really should move if you feel it’s the right time. Also, if you feel you’re not happy or if it’s just not really working anymore. You pay a lot a money for your sport, so you should enjoy it! If you need certain things like individual turnout or certain feeding. You need a yard that can and will cater to those needs – you’re not demanding it just to be difficult, you’re just fulfilling the needs of your horse. So, what do you do when you decide it’s time to move on? Deciding to move is a very big step. I myself went through this move very recently. The yard I was at, wasn’t meeting my needs anymore and hadn’t for some time. So, this is the experience I went through when moving yards. This largely depends on you, your horse and what you want to do. Everyone has different preferences. Are you more of a casual/hobby rider or competition orientated, all these different disciplines, horses & riders often have different needs (I’d view myself more of a competition orientated rider). Also, what is your horses personality like? If they’re nervous a big busy yard might make them worse. They may need a more relaxed and quiet yard even if you don’t. There’s no point going somewhere you love and your horse hates. Do think carefully, do your research and take your time but bear in mind sometimes the grass isn’t always greener. Rushing the process might actually have you end up in a worse situation. I personally spent months looking before I made the big move. 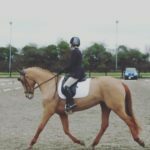 I had been based in a riding school for years, when I was younger it was great but as I got more and more competition oriented, especially with dressage, it just wasn’t working for me anymore. It was getting too busy to get my horses ridden. It also didn’t suit my newly acquired youngster, due to the busy nature of the yard and lots of people coming and going. He became quite nervous in his stable and wasn’t his happy normal self. However, it did have 24/7 turnout in the summer where horses could relax and enjoy themselves. I found this always resulted in happy horses for most, but the lack of routine didn’t make for a good competition season. Off I went in search of somewhere quieter with an emphasis on routine. If you’re thinking of making the big move I suggest making a list of what you want, what you’re willing to compromise on and what you under no circumstances want. Be realistic and take your budget into account. Unless you build it yourself its near impossible to find a yard that has everything you want. Therefore, compromise is a must, or you may end up disappointed. The yard must be quiet – small number of liveries/boarders would be ideal. A relaxed atmosphere for the horses. Also, you want a yard/barn with little drama, you’re going to spend a lot of time at this place and riding your horses. So, it should be an enjoyable place. Try and figure out when visiting yards/barn if it presents a friendly atmosphere to you, or is there something that just doesn’t feel right? There must be turnout – I was willing to compromise a little here by not having them live out 24/7 but it had to be safe (a field that only my own horses would be in and both with boots on!). Freedom – I wanted a yard/barn where I can come and go as I please. A place where there were no restrictions on riding time or appearing early on show mornings. Be careful here because some yards/barns have rules in place about what times it’s open for owners to come and go. Which can cause issues if you yourself are stuck only being able to ride after work. However, yards/barns that have opening times can be more secure, as they’re more aware as to people on the premises. I wanted an established routine – fed at the same times each day, I also wanted the option to be fed twice a day, turnout at the same times etc. Good arena surface – this is essential for me as it reduces the chances of injury. Many places don’t have a regular maintenance program for their arenas unless they hold regular shows. Given that I’m riding in Ireland and with the weather we have, an indoor arena would have been ideal but most quiet yards/barns aren’t big enough to have one. So, I knew this was a big ask! I’ve already stated that turnout was essential, but I was willing to compromise. I knew winter turnout was another big ask. Arena size was another area of compromise. Ideally, I would have liked a big arena, something that was at least 60 metres in length. Again, these are normally only found in yards/barns that offer regular shows, which doesn’t always make them the quietest of yards/barns. Facilities – all I wanted was a good quality arena and somewhere to hack on the down days. I normally go to my trainer’s yard for lessons and go to other locations for all schooling such as cross-country. So, having a cross country course or anything extra wasn’t on my must have list. That’s the basic list I had comprised when I was considering my move. Its somewhere to start if you’re considering it. My only absolute no was riding schools. Under no circumstances did I want to end up in another one. My last piece of advice to leave you with is to have a few conversations with your new potential yard owner. Be clear about what you expect from them and what they expect from you. Also visit it as much as you like, on different days and at different times so you get the full picture of it. Also visit it with a friend or family member to get a second opinion, two heads can be better than one. If you find they have a Facebook page or something similar, have a look to see what types of reviews people have put. You can always use social media sites to try and get recommendations for potential yards/ barns, but don’t always just take the word of one person. Make sure you do your research. Making sure it’s right for both you and your horse is the most important thing.